The Samsung Gear 360 is considered to be one of the best 360° cameras out of the recent glut of releases. It shoots full 360 degree video in 4K and has a very intuitive app; but is also one of the most expensive to be released in 2016, until now that is! Last week the Samsung Gear 360 would have set you back between $340 – $360, but now there has been a price cut of $50 and the camera is now available for $299. This offer is on Amazon.com and could either be a temporary cut for the holiday season or a permanent cut. If you’ve been thinking about getting a Gear 360 but have been holding off due to cost, now is the time to jump on this offer as the Gear 360 has never been cheaper. At $299 the Samsung Gear 360 is almost certainly the best value 360 camera available right now. Compared to similar 360 cameras, such as the Ricoh Theta S, the Samsung is without doubt a superior piece of kit and is now nearly the same price. If you don’t believe me then check the 144 reviews on Amazon where the camera has an overall 4 star rating! 4K 360 camera with great video capabilities. Now $50 off. 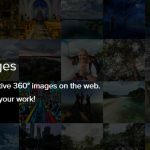 Kuula - The best place to upload and host your 360 photos.